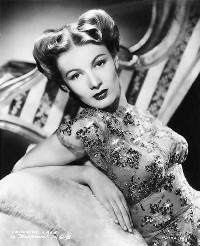 During the 1940's Veronica Lake captivated Hollywood audiences like few other actresses. She was a popular pinup queen during WWII and won fame co-starring in several films with Alan Ladd (Lake was short enough to play along aside the diminutive Ladd without emphasizing his small stature). Her claim to fame came with her celebrated "peek a boo" hairstyle, which many women in the early 1940's emulated, to the point where she was asked to change because it endangered the hair of female workers with armaments machinery! Most recently, Kim Basinger adopted this "Lake look" all the way to an Oscar in the film L.A. Confidential. By the early 1950's however, Lake's career had hit the skids. Three broken marriages, a domineering stage mother, a manic depressive personality, and a whole lot o' liquor pushed her right into oblivion. After 1952, she would make only two more films, both low budget horror film trash. She frequented skid row hotels in New York City and even took work as a barmaid to keep close to a steady supply of booze. By the late 1960's she had bottomed out in Hollywood, Florida, often holing up in her apartment out of paranoid fears that the FBI was following her and tapping her phone. http://www.viximus.com/_Viximus/Photos/Raw/00506B0B-782F-4597-85EC-254B7C8B3EA3.jpg Lake was one of the models for the animated character of Jessica Rabbit in the 1988 film "Who Framed Roger Rabbit", especially for her hairstyle.